Lighthouse. March. 23, 2019 07:30. by Eun-Taek Lee nabi@donga.com. We are afraid of darkness. To be precise, we are not afraid of the darkness itself. What we really fear is the fact that we do not know what is in the dark. That is when our imagination kicks in. We imagine about what is opening its mouth in the dark, waiting to prey on us. When imagination reaches its maximum, the darkness becomes a scary monster. What makes it a monster is not itself but ourselves. The fact that we do not know what is in the dark gives it the greatest power in the world. When you stand on a deck in a jet-black night, you can exactly feel the power of darkness. A lightless night sea exists only by the sound of waves. The sky is completely dark as well. In the dark, you cannot think rationally and become extremely sensitive and anxious. 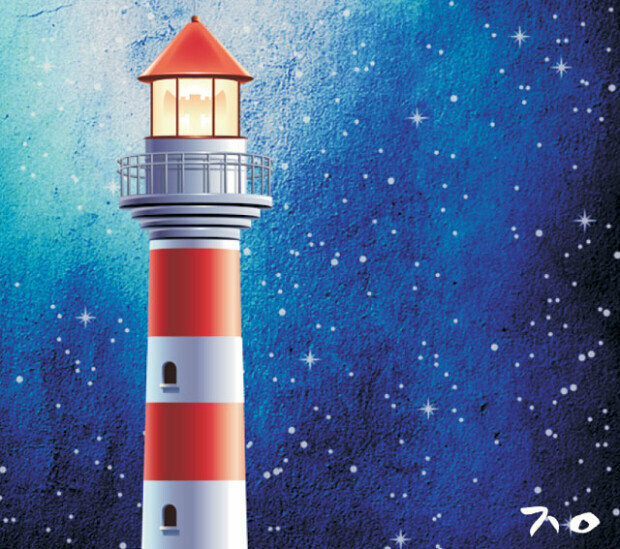 The poem “Lighthouse” was created in this frightening circumstance. In the poem, the sea is dark and a strong whirlwind is blowing over it. Someone in the poem has to fight against the darkness and the wind. In this fierce fight, someone spotted a lighthouse. The lighthouse was fighting against them like a brave gladiator. And the poet tried to learn something from the lighthouse: How to fully live the present, not to be afraid of the future, and not to regret the past. This is why the lighthouse exists in the poem. Reading the poem, we think about the darkness that haunts us. The darkness in our lives, such as uncertain future, the power we do not have, and the life we have not lived. The darkness would become darker with our fear. The darker it gets, the weaker we become. In times like this, all we need is a gleam of light. It is time that we light up the lighthouse in our mind.